Everyone lives in a watershed, but often we don’t realize how intertwined our lives, histories, health, and futures are with the watersheds we call home. Students explore the grasslands of the Cienega watershed. The shared history timeline is an impressive visual document that represents a small portion of the many efforts and experiences that have contributed to the current state of the watershed. Participants report that they come away with a feeling of being a part of a community of action. An important part of the exercise is that the shared history timeline doesn’t end at the current date, but extends many years into the future. It asks, what will the watershed look like in ten years, twenty, or fifty years from now? Southwest Decisions Resources has facilitated these Shared History timelines in partnership with the aforementioned watershed groups. However, to date, the voices of youth, teachers and schools have been largely absent from these Shared History exercises. The Cienega Watershed Partnership would like to build on the Shared History work by actively engaging young people in their watersheds. The Shared History of the Watershed Curriculum Project will occur in two watersheds, Cienega Creek and Altar Valley, that have completed a shared history exercise. A middle or high school class in each watershed will be asked to participate. 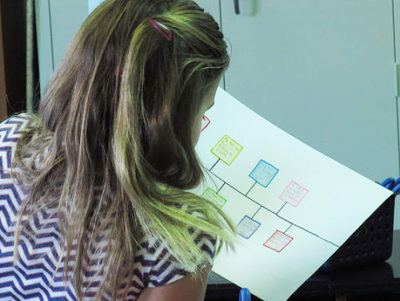 An Elgin school student reviews her personal timeline, which she created at the start of the Shared History project. The Curriculum Coordinator will work with two teachers in each school to help design a curriculum based on the information previously gathered in the shared histories. The Curriculum Coordinator will deliver two in-depth lessons per watershed to serve as a model. Students will be trained to conduct oral histories of local residents and document their own experiences of living in the watershed. The enduring results of this project will be a pilot of a teaching resource about the history and science of the local watersheds that can be refined going forward. No such resource currently exists. As a result of this project, teachers will have a tool to illustrate their social studies and science curricula with local examples. Students will be able to locate themselves not only in the physical space of the watershed, but also as historical participants. By conducting oral histories with local residents, students will gain historical understandings and make personal connections to their neighbors. Through digital storytelling exercises, students will learn to tell their own experiences of living in the watershed. These stories will be added to the timeline. 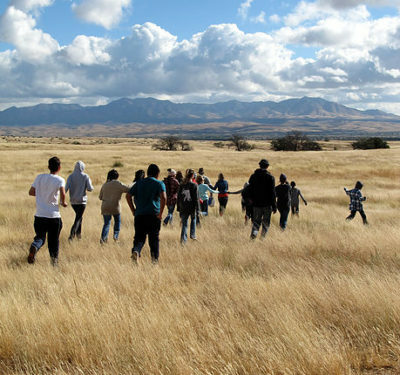 Located in the grasslands of the Sonoita Valley, the Elgin School is teaching students to care for and appreciate the delicate, arid landscape upon which so much of the area’s livelihood depends. Sixth grade language arts teacher Michelle Siebert and science teacher Annette Koweek opened their classrooms to us and have embraced the project whole-heartedly. STEM Coordinator Kathryn Zanin is working hard to bring this project into the Altar Valley Middle School. The project is an excellent fit for the STEM subjects and will benefit the community by iicreasing awareness of the watershed, conservation awareness to develop good stewardship of the land, critical thinking and problem solving skills as students gather and analyze and record data, communication skills as students interview community members, connection to the members of the community, appreciation for the elders in the community for their contribution to the land, and understanding of their role as community members to protect the watershed. The VPS has graciously shared their extensive knowledge of oral history best practices with the SHW project. Director J.J. Lamb has conducted many oral history projects in local schools and has shared her knowledge and procedures in support of more youth learning their local history and heritage. Since its formation in 1995, the AVCA has been working collaboratively to conserve healthy and productive working landscapes, promote a thriving agricultural economy, and sustain a resilient rural community enriched by the culture and history of the Altar Valley.